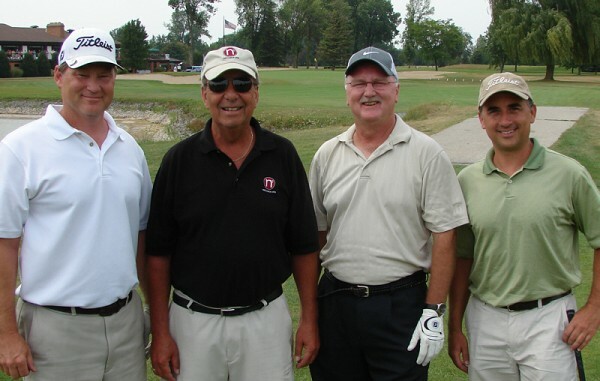 CHAMBER GOLF CHALLENGE WINNERS -- (L/R) Andy Skrzypczak, Tony Hages, Bill Sielinski and Scott Halstead (NetSource One) - This 4-some posted the best score at Bay City Country Club and then defeated Bay Valley team in a playoff for the Trophy. Andy Skrzypczak calmly sank a short 10-foot putt to force overtime. And then dropped a chip shot within 3 feet of the hole to help his NetSource One Team claim the "first ever" Chamber Golf Challenge Tournament. NetSource One earned a spot in the Finals by posting the best score of the day at the Bay City Country Club. Sharing the spotlight in the winner's circle with Andy were: Bill Sielinski, Tony Hages and Scott Halstead. Coming in second was the Bay Valley sponsored team who scored best at the Bay Valley Golf Club. Team members were: Terry Hall, Tom Napieralski, Sharon Rudrow and Cameron Volders. Sixty (60) teams took part in the one-day Best Ball Tournament sponsored by the Bay Area Chamber of Commerce. The turnout of 240 golfers was unprecedented for the event. At the end of the day, Mike Seward was beaming as the golfers came off the links to record their scores. "Absolutely FANTASTIC" was the comment that Seward expressed. "And all the credit goes to David Green," Seward quickly added. "This new format was totally Green's idea and he deserves all the credit," Seward. Seward was referring to the new 2012 playoff format that sent half of the golfers to Bay Valley and the other half to Bay City Country Club. According to past coverage, the most teams entered were 38. This year, there were 60 teams entered -- 30 played at each golfing location -- With the winners facing off in a 1-hole playoff. "I am very very happy with the turnout," David Green said as play concluded. "I don't think anyone could have envisioned this kind (60 teams) of a turnout." Green went on to say that getting the two golf courses to finish up at the same time was problematic. "Tell everybody that we'll have a better handle on that next year," Green said. "Getting 240 golfers to finish at the same time is a bit tricky," he smiled. "All in all, it was a winner," Green concluded. THE GALLERY -- The rest of the participants in the Golf Challenge look over the 18th green, from the deck of the Country Club, during the Golf Challenge playoff. KEEPING TRACK -- Official Scorekeeper, Tom Nowosatka kept a close tally on all scores as they were turned in at Bay City Country Club. ALL EYES FOCUSED -- All eight golfers involved in the one-hole playoff watch as a birdie attempt is tried on the 18th Green at Bay City Country Club during the Championship Playoff. Bay City Country Club owner Art Dore (Left) and Bay City Area Chamber President Mike Seward keep close tabs on all the action during the First Annual Chamber Golf Challenge Tournament.